eDAQ makes potentiostats, electrodes and accessories for specialised and general purpose electrochemistry and electrochemical applications. 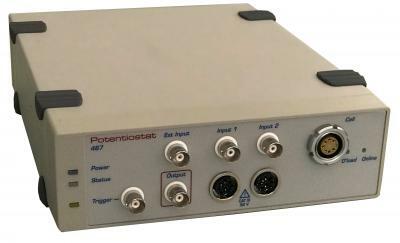 A potentiostat is a device that controls the potential between a pair of electrodes while measuring the resulting current flow. The resulting electrochemical plot is then used to determine various parameters relevant to the experiment. The 3-electrode potentiostat is typically what people refer to when they say a 'potentiostat'. With a '3-electrode' potentiostat the potential is monitored between a reference and working electrode that are both in close proximity, while the potential of a relatively distant auxiliary electrode is adjusted. The current flow is measured between the working and auxiliary electrodes. This has the advantage that no current actually passes through the reference electrode, so there is no electrolytic reaction occurring there, and thus the reference electrode potential can remain constant throughout the experiment. A consequence of this arrangement is that the potential between the working and auxiliary electrodes (the 'compliance' potential, which is usually not reported) can be many times the applied potential (depending on electrolyte resistance and distance between the electrodes). By attaching the potentiostat reference and auxiliary inputs to the same 'counter' electrode a three-electrode potentiostat can be used as a two-electrode potentiostat. All the potentiostats below can be operated as 3 electrode potentiostats. A bipotentiostat system features a reference and auxiliary electrode, and two working electrodes, whose potentials can be independently adjusted while the current flowing through them is monitored. This principle can be extended to any number of working electrodes, for example the EA164 QuadStat controls up to four working electrodes. Typically the potential between the reference and first working electrode is controlled and the potentials of subsequent working electrodes are offset relative to the first electrode to achieve the desired effect. These potentiostats are often used in 'electrochemical nose' systems. The term '4-electrode potentiostat' is usually reserved for a device with two reference ('voltage sensing') electrodes and two working ('current passing') electrodes. The potential difference between the two reference electrodes is controlled while the current flow between the two working electrodes is monitored. These potentiostats are commonly used to measure the electrochemical current flow across a membrane separating two compartments, or across the interface of two immiscible solvents (an ITES experiment). 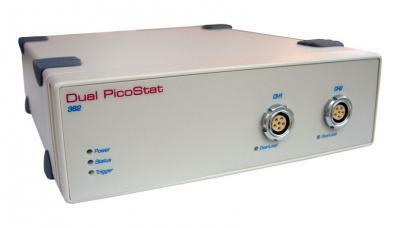 The EA362 Dual Picostat can be used in 4-electrode mode. The EA167 Dual Reference Adaptor can convert most three electrode potentiostats into a 4-electrode system. High sensitivity potentiostat for use with carbon fibre and other microelectrodes. Features bipotentiostat and 4-electrode modes of operation. Allows two reference electrodes to be connected to the single reference electrode input of a potentiostat. Ideal for transmembrane and ITES experiments.